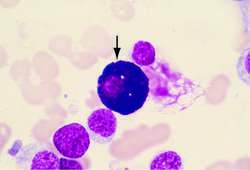 A cell in the blood of vertebrates that transports oxygen and carbon dioxide to and from the tissues. 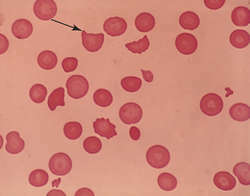 In mammals, the red blood cell is disk-shaped and biconcave, contains hemoglobin, and lacks a nucleus. 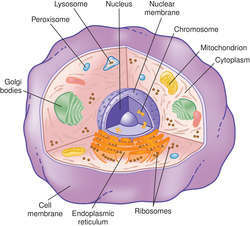 Also called erythrocyte, red cell, red corpuscle. 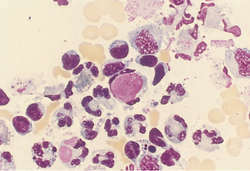 A mature, non-nucleated cell averaging 7–8 µm in diameter, which is round or ovoid on peripheral smear, contains haemoglobin and has a zone of central pallor due to the cell’s biconcavity. Erythrocytes are normally confined to blood vessels (aorta, arteries, arterioles, capillaries, venules, veins, inferior vena cava and superior vena cava), the heart and pulmonary vasculature. Haemoglobin, the main erythrocyte protein, is tasked with transporting O2 to tissues and CO2 away from tissues. Erythrocytes have an average lifespan of 120 days. 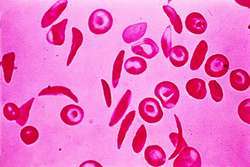 Synonym(s): hemacyte, red blood cell, red cell, red corpuscle. Hemoglobin-containing blood cells that transport oxygen from the lungs to tissues. In the tissues, the red blood cells exchange their oxygen for carbon dioxide, which is brought back to the lungs to be exhaled. Scientists have been working for years on how to manufacture red blood cells to offer an alternative to donated blood to treat patients. Etingin explains, noting that very small red blood cells tend to be related to low iron levels, while very large red blood cells are usually associated with vitamin B12 deficiency. The Biopure recipe may be even more efficient than your own red blood cells at delivering oxygen to body tissues. Hematocrit is the percentage of red blood cells by volume in a blood sample. ACE-536 is a novel ligand trap that binds to and prevents signaling of red blood cell growth and differentiation factors (GDFs) that are members of the TGF- superfamily of proteins. There were 75 positions on the genome that were strongly associated with one or more of the red blood cell characteristics," Ferreira said. 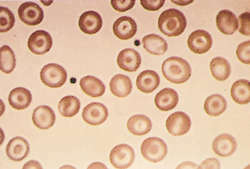 To deliberately create asymmetry, the researchers attached one end of a chain to a red blood cell, which was an appropriate size and easy to affix. Anemia is characterized by a shortage of oxygen-carrying red blood cells that normally fuel the body. Developed to improve the safety of red blood cell transfusions, the system is designed to inactivate pathogens that may be present in donated red blood cells, while preserving the blood products' therapeutic properties. Jeff Jackman, program coordinator, predicts the procedure will become mainstream, particularly once one of several red blood cell substitutes in clinical trials is approved.